So, you've decided to use Open Biblio the free online library system? But, you want to attach it to a website that you're hosting outside of your building (somewhere on the Internet). Why would you want to do this? Well, I find that in-house servers can be a cumbersome thing to maintain. You have to ensure that backups are properly working and scheduled. If something happens, and your server goes down, it's your responsibility to ensure it gets up and working. It takes up space. It uses bandwidth. I could go on and on and on. So, hosting it elsewhere resolves most of these problems. The most distinct disadvantage is it's advantage; it's not in your hands. So if something happens to your external server, then you're screwed. So get a good web service. Here, I have taken the trouble in actually setting up Open Biblio on a third-party server since I already have an external webserver and don't want to clutter my personal one with this. It's not hard at all, just follow these steps and you will have a fully functional online library. Usually your webhost will gloat and brag about having this somewhere on their site. If not, ask around the forums or send an email to the admins asking them if they've got what it takes. If not - stop. You can't use this. Step 2: Download the software. Download it here. Step 3: When it is down downloaded, you will need to Unzip the folder (by double-clicking on it). Step 4: Use your FTP program. If you have no idea what that is, follow the next few steps. If you do, scroll down until you reach the next step. FTP stands for File Transfer Protocol. It is used to move file quickly from one computer to another. It will ask you for 3 things. Step 5: Upload the entire contents of the Open Biblio folder you've unzipped or upload the entire Open Biblio folder itself. If you're using a FTP program, this is as simple as drag and dropping it from one side into the other. Note: Dragging the entire folder over is better. Do NOT delete the folder on your computer. This will save you some time at later stages as you will have to modify some files. 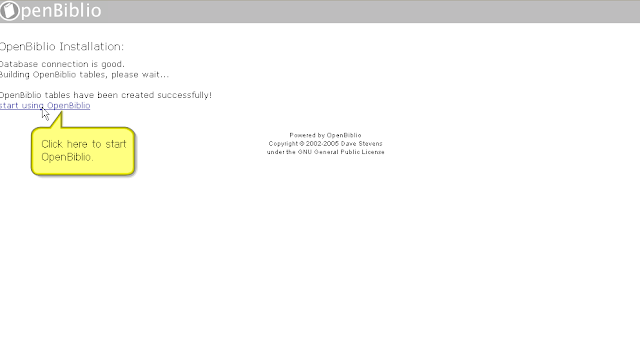 Step 6: After uploading the contents of the folder onto your server log into your host's MySQL server. Here you will encounter 1 or 2 things. Either your host will allow you to create multiple databases or not. Some hosts think that 1 database for everything is fine. It is, but it just makes more sense to have two different databases doing two different tasks, although 1 database with multiple tables will be fine. 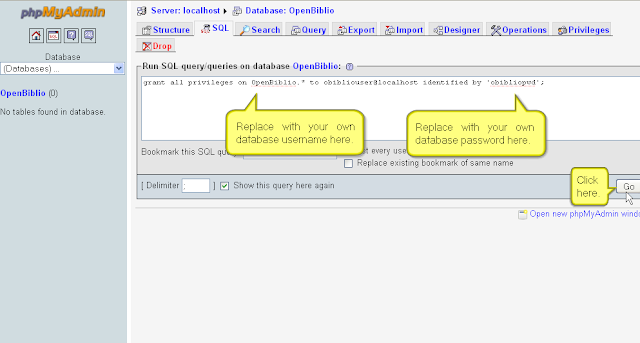 It will work if you have just a single database with multiple tables. It is strongly recommended that you use a separate database. 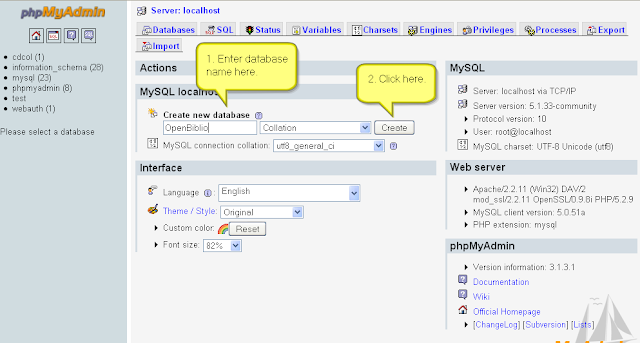 Log in to MySQL. Usually you will use phpMyAdmin. This is what I am going to go by. 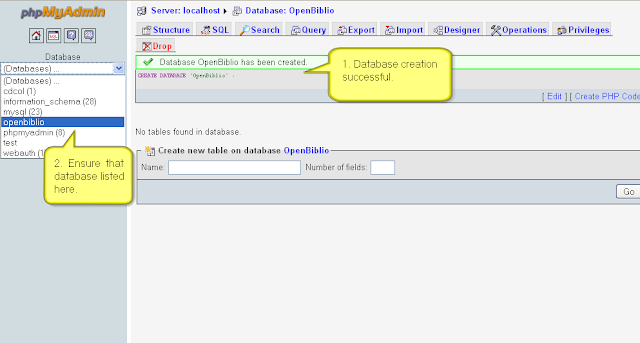 Now in the main screen you will see a shortcut called Databases. If you see this image below, stop and go to where it says Single Database Hosts. If not, proceed to the next step. Once the database has been created, a confirmation will appear. To make sure, check the list as shown. Remember the username and password you have created for the next step. This is important! If you do not have the ability to make a new database, you can instead create a new table. Does this degrade from the performance and response of a website? Yes. It does. Does it do so drastically? That depends on the amount of access you require from the database. And, going by personal experience, I have not noticed any differences at all. In a Single Database Host, your service provider would have already created the database for you, usually with the same name as your login. 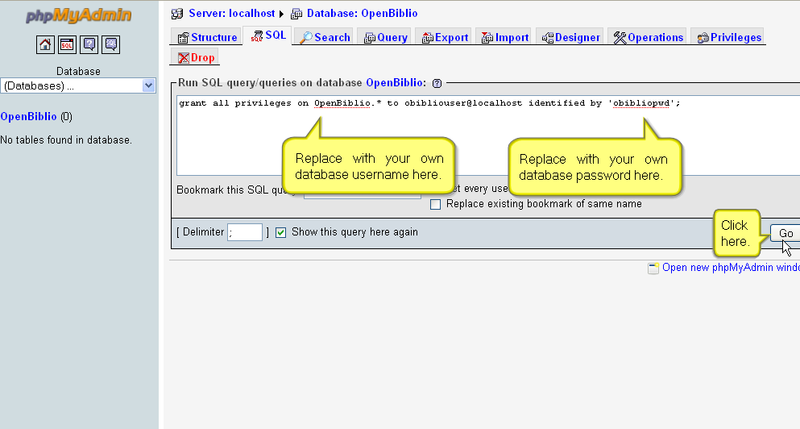 So, if your username for the website is 'quickdraw', then chances are that your database name will also be 'quickdraw'. When you log in, the name of the database will be given to you. Step 7: Now you are ready to modify the connection to the database. 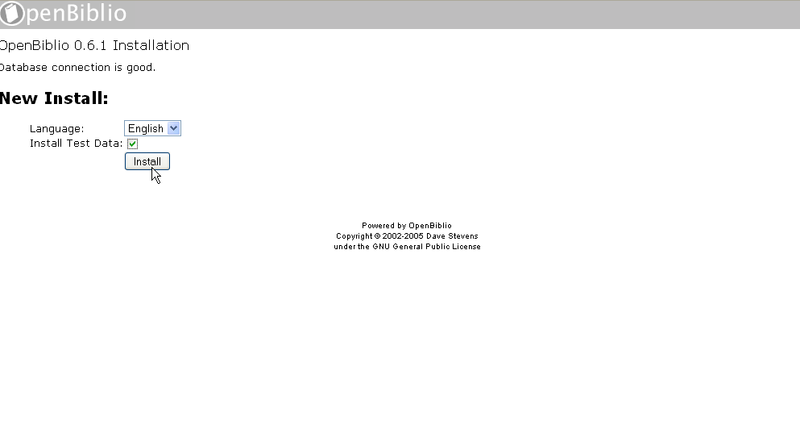 On your computer (if you have not deleted the OpenBiblio folder) find the OpenBiblio folder. The file called database_constants.php will be there. Using Notepad (Start > Run > 'notepad' > [OK] ) open the database_constants.php file. Download the file back onto your computer (somewhere you can easily find, i.e. the Desktop) and use Notepad. Mac - If you're using a Mac, you're going to have to download a text editor as Text Edit is not a program utility and will modify the code. You are going to have to download something similar. I use TextWrangler. Note: When you open the file, if you see a lot of text, but nothing coherent, hit the 'Word Wrap' button under 'Format' in the toolbar. You should be able to see a bunch of readable text. 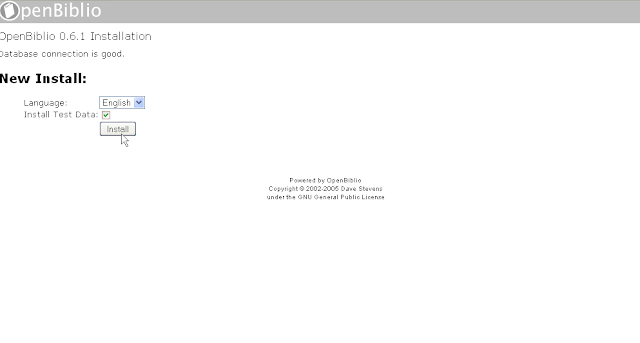 Where it says define ("OBIB_DATABASE", "OpenBiblio");Change OpenBiblio to the name of the database you entered from before. 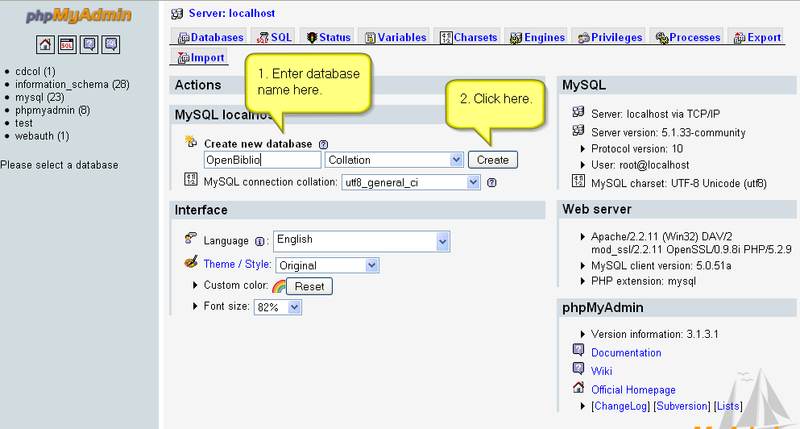 Step 8: Now you will have to upload the modified database_constants.php onto the server using your FTP program. It will tell you that a file already exists under that name and will ask you to do one of several things. Select Overwrite File as you will no longer be using the old one. If you really are scared, you can rename the old file (e.g. call it database_constants.php.bak), that way it won't be deleted. 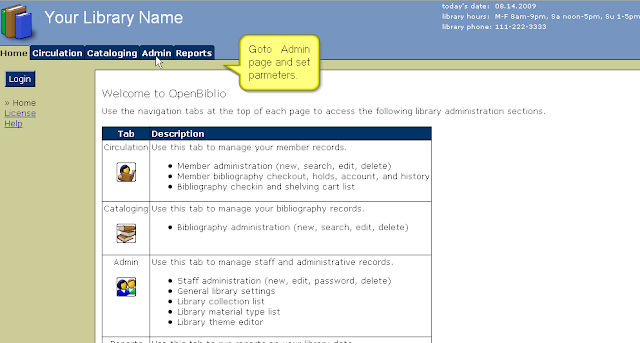 Step 9: Now with your database all set up, you're ready to install OpenBiblio. Replace the domain with your domain you are using. I would recommend clicking the 'Install Test Data' as it gives you a better idea on how the site works. Step 11: Break out a six-pack, because you're done. Installing it, at least. Now you will have to populate it with your books. The default username and password is 'admin'. Thanks for this. I've updated the link above to avoid confusion. Oh, by the way: Open Biblio = OpenBiblio by Frederic Descamps, not to be confused with OpenBiblio by Dave Stevens and others.